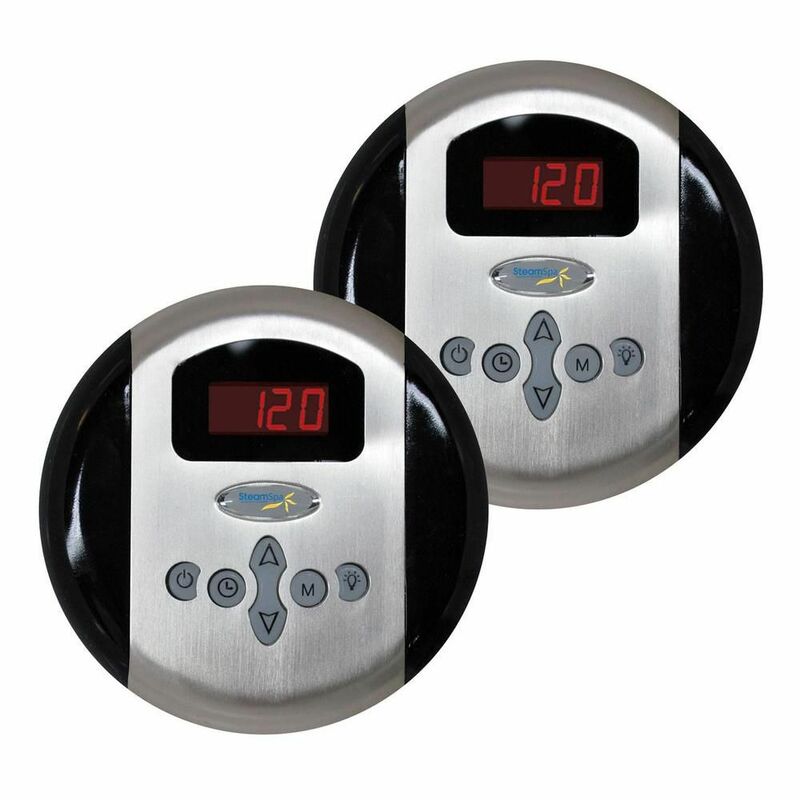 The dual control panels are the ideal input devices for any SteamSpa steam generator. With a large LCD displays and a simple to use interface these control panels allow access to room temperature controls and time setting options for your generator. Also featured are memory banks to store your settings for future use. With their stylish design this pair will match with most any bathroom style or dicor adding to the luxurious sauna atmosphere. This dual panel system allows for even more flexibility with installation setups including having a panel on the inside and outside of your sauna enclosure. Take control of your ideal sauna experience with our dual control panels and create the steam sauna experience that's perfect for you. Digital readout display and soft touch keypad. On/Off and Pause modes. Built in temperature probe gauges the showers temperature for added comfort. Inside/outside the enclosure installation. The perfect steam sauna experience is exactly what we had in mind with SteamSpa steam generator packages. Easy to install and even easier to operate these steam generators produce a consistent flow of soft and soothing steam thanks to the cleverly designed dual tank technology while minimizing any distracting operational noises. Compact in size and design they also feature the Auto Drain system that aids in making maintenance easier by purging the generator of any excess water/minerals that would later contribute to issues down the line. All in all you get a safe, quite, reliable, luxurious steam sauna experience with our compact powerhouse of a steam generator. Adding to the luxury empowered by the generator are the wonderful accessories included which will aid your relaxing steam experience in finishes creating a thoroughly holistic sauna decor. Get the perfect steam sauna experience at home with the SteamSpa Oasis 9kW Steam Bath Generator Package. The package includes a 9kW QuickStart generator, control panel, steam head, pressure relief valve and auto drain. The steam head uses aromatherapy to give you an even more relaxing experience; just add a few drops of your favourite scent and enjoy. Programmable Dual Control Panels in Chrome The dual control panels are the ideal input devices for any SteamSpa steam generator. With a large LCD displays and a simple to use interface these control panels allow access to room temperature controls and time setting options for your generator. Also featured are memory banks to store your settings for future use. With their stylish design this pair will match with most any bathroom style or dicor adding to the luxurious sauna atmosphere. This dual panel system allows for even more flexibility with installation setups including having a panel on the inside and outside of your sauna enclosure. Take control of your ideal sauna experience with our dual control panels and create the steam sauna experience that's perfect for you.